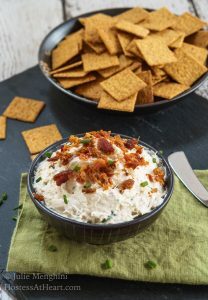 Easy Crab Dip with Bacon recipe will appeal to anyone that walks through the door. It’s perfect for a fancy affair or the next pigskin party. This post is sponsored by Bakers Supermarkets, but the content and opinions expressed here are strictly my own. It doesn’t matter what kind of entertaining I do, I want to have appetizers out for my guests to munch on when they arrive. I think appetizers break the ice and get the conversation going. 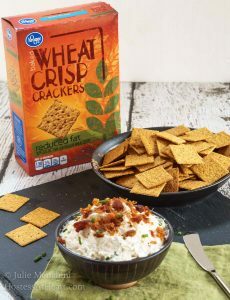 I want my appetizers to be simple and delicious like this Easy Crab Dip with Bacon recipe. What is it about appetizers? I spend more time searching for appetizers than I do a dinner dish. What I want is a recipe that people want to eat but doesn’t take all day to make. It all started with this beautiful container of lump crab meat that I found in the meat department. When you live in Nebraska, you can’t go crabbing (whining) so finding fresh seafood isn’t always that easy to do. This Lump Crab was luscious and I didn’t want to cover up its’ tender sweet flavor. It’s definitely the star of this recipe. 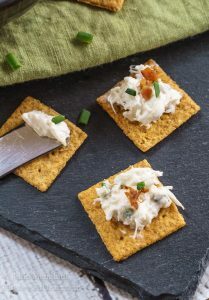 Easy Crab Dip with Bacon recipe will appeal to anyone that walks through the door. It's perfect for a fancy affair or the next pigskin party. Blend Neufchatel cheese and sour cream together until smooth. I used a hand-held electric mixer. Shred the crab and stir in all of the remaining ingredients except for the bacon pieces. Sprinkle with bacon pieces and additional Chive right before serving. 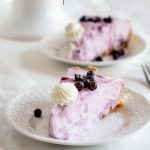 I think you will agree when you try this recipe that it is delicious and will appeal to any seafood lover. 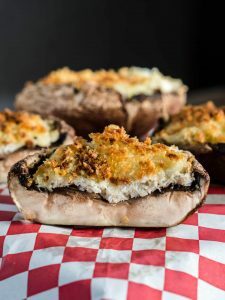 It tastes rich, cheesy, and creamy and is perfect on a nice crunchy Kroger Wheat Crisp cracker or even on a baked potato! 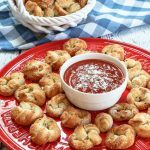 Here are a couple other great appetizers! It would be hard to find something that I didn’t think could be improved by adding bacon. 🙂 But this sounds like a fabulous combination, Julie. Bacon-licious and scrumptious! Thank you, Teagan! I’m in agreement, bacon can be a very good thing! Enjoy your day my friend! 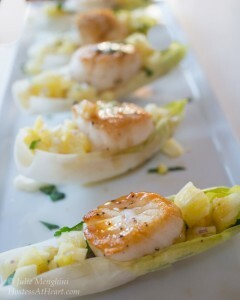 Oh, and I was so caught up in bacon dreams that I forgot to mention those endives with scallops — So elegant…! Have a lovely week. Thank you, Teagan! I hope you have a lovely week too. Looks so incredibly good, yum yum yum! Thank you, Zaza! So easy too! Appreciate you stopping by! Thank you, Sarah! I just love entertaining and feeding people and may notice that there is a game on LOL! Have a wonderful weekend! 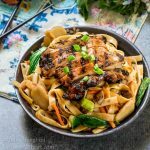 It’s super easy and delicious. Thank you, Theresa! Two favorite ingredients – crab and bacon! 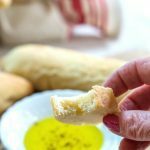 I always have some kind of appetizer too when I have guests and your recipe looks like a good choice Julie. That looks soooo yummy! Can’t wait to try it! It was hard not to eat it as finger food Loretta! We just love good seafood and it’s tough not having access to a lot of it. I love crab cakes too. Next time…. I am a huge fan of appetizers. 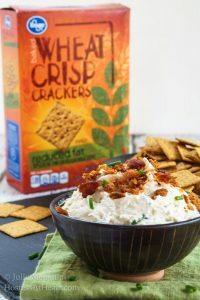 Such a great idea and spin on a regular crab dip. Looks yummy Julie! Thank you Antonia! I’m an appetizer fan too! Yup, I could eat that whole bowl of dip by myself. You had me at easy crab dip! Ha I think John pretty much did Lily! Thank you! Woo hoo Sonal! Thank you! Delicious dip Julie, I don’t have a Bakers or Kroger supermarket in NYC, wish I did. 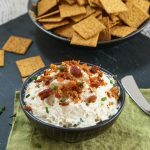 The dip sounds fantastic, perfect for game day or a party. Saved!! Thank you so much, Suzanne! Baker’s are probably the oldest chain of stores that we still have here. I appreciate you saving the recipe. We really enjoyed it. Yum! This sounds so good and I love all of the products from Kroger. 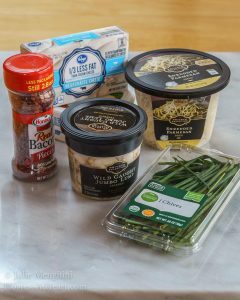 I will be heading to my Kroger today to pick up some of these ingredients. Thank you, Quinn! I love the quality products they carry too!